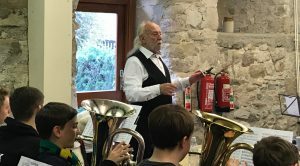 In early Spring Lancashire Youth Brass Band recently spent a residential weekend at Borwick Hall for the 3rd year running. 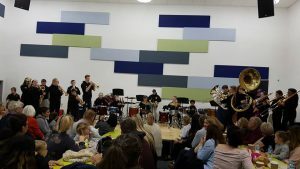 The weekend not only gave the young musicians the chance to bond socially as group but it also presented a golden opportunity for the band to rehearse intensively for an upcoming Music for Youth performance. 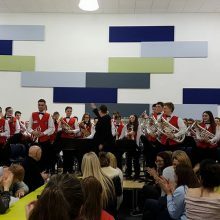 The residential course began on a cold Friday evening in March, and kicked off with a good balance of rehearsals and social activities which continued right up to Sunday, when the band had the opportunity to work with world famous conductor and educator Richard Evans. Richard motivated the Band in many ways as well as providing great encouragement, complimenting them on their tremendous progress in the last two years and their overall ability. LYBB pictured with Richard Evans. LYBB and the Lancashire Youth Street Band ‘HONK’ went on to do two fantastic performances at the Music For Youth Regional Festival in Rochdale – Music for Youth is a national youth arts charity working to provide young people aged 21 and under across the UK with free, life-changing performance and progression opportunities, regardless of background or musical style. The Regional Festival takes place in March and bands are selected to take part in the National Festival in July 2018. Both bands wait to hear if they have been selected for the prestigious National Festival to be held in Birmingham. To find out more about Lancashire Music Hub County Ensembles visit our Make Music page.